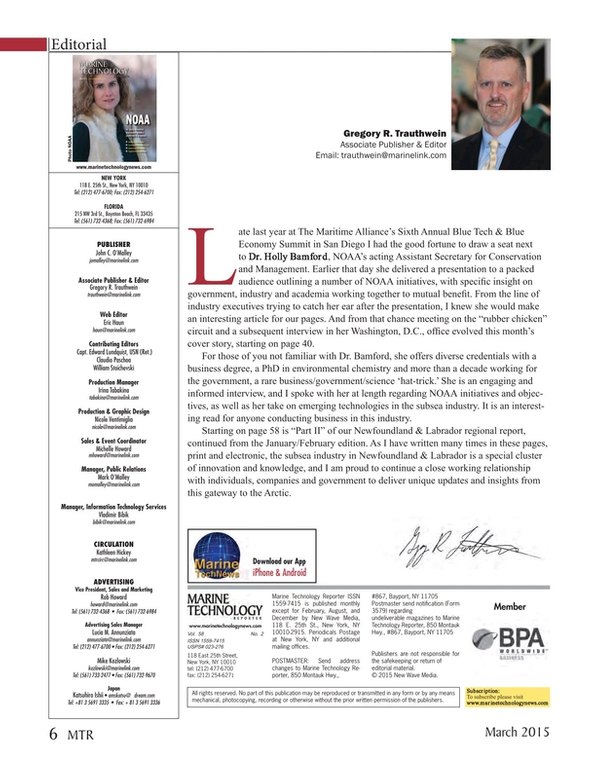 Late last year at The Maritime Alliance’s Sixth Annual Blue Tech & Blue Economy Summit in San Diego I had the good fortune to draw a seat next to Dr. Holly Bamford, NOAA’s acting Assistant Secretary for Conservation and Management. Earlier that day she delivered a presentation to a packed audience outlining a number of NOAA initiatives, with specific insight on government, industry and academia working together to mutual benefit. From the line of industry executives trying to catch her ear after the presentation, I knew she would make an interesting article for our pages. And from that chance meeting on the “rubber chicken” circuit and a subsequent interview in her Washington, D.C., office evolved this month’s cover story, starting on page 40. For those of you not familiar with Dr. Bamford, she offers diverse credentials with a business degree, a PhD in environmental chemistry and more than a decade working for the government, a rare business/government/science ‘hat-trick.’ She is an engaging and informed interview, and I spoke with her at length regarding NOAA initiatives and objectives, as well as her take on emerging technologies in the subsea industry. It is an interesting read for anyone conducting business in this industry. Starting on page 58 is “Part II” of our Newfoundland & Labrador regional report, continued from the January/February edition. As I have written many times in these pages, print and electronic, the subsea industry in Newfoundland & Labrador is a special cluster of innovation and knowledge, and I am proud to continue a close working relationship with individuals, companies and government to deliver unique updates and insights from this gateway to the Arctic.